Portal-Statistik |Today I will shared about R Application and R Packages, I think this tutorial for beginers only, not for master or professional programmer. R is a powerfull application for analytics, R is open source software, all of people can devlope it. One of the reasons R Application to be very popular software is the availability of a package (collection of functions, data and code). Until now, there are more than 6 thousand R packages in CRAN repository. Not including packages provided by other sources. The packages number continues to growing from day-to-day exponentially. If you installed R for the first time, only a few standard packages that come installed. So you must be install R packages as your need. This tutorial, explain you step by step how to install R Packages. Installing R packages from a local. The first, Download your packages form the CRAN R , from the cran select and download the package you want to install. If successful, the R console will give a message package 'twitteR' successfully unpacked and MD5 sums checked. Then select the CRAN mirror, for example, "Indonesia (Jakarta)". Same as installing packages from a local file, the R console will give a message package 'twitteR' successfully unpacked and MD5 sums checked. Two packages are installed and running to the R session, It’s so simple right? 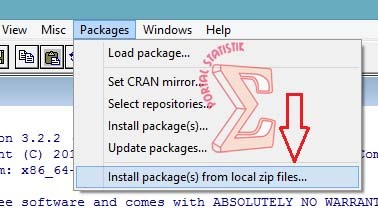 0 Komentar untuk "How to Install R Packages"